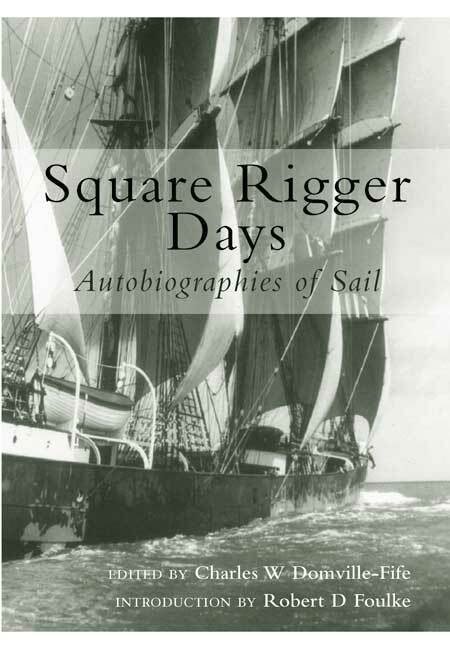 You'll be £0.99 closer to your next £10.00 credit when you purchase Square Rigger Days. What's this? The second half of the 19th century saw the creation of the most beautiful ships the world has ever known. But, as time passes, the often brutal reality of life under sail has been blurred by a veil of nostalgic sentimentality. Bruce Stannard removes his rose-tinted spectacles to look at a new book in which the men who crewed the great wind ships describe what it was really like to be lying out on the tops'I yards in a Cape Horn gale. The three-masted British barque Garthsnaid rounding Cape Horn, January 1920. When I was a child growing up on Balmain's gritty industrial waterfront in the immediate post war years, it was still possible to take a ferry across Darling Harbour to Erskine Street Wharf and there, in the rough and tumble heart of the old working waterfront, enter a world that had changed but little since the roaring days when the port of Sydney was crowded with sailing ships from around the world. As a barefoot boy I earned my first meagre wages selling tabloid newspapers in smoke-filled, beer-slopped sailors' dives up and down 'Erko' and the Hungry Mile. There, pitched in among rowdy mobs of painted whores and drunken seamen, I was given the kind of wide-eyed education no boy ever gets at school. I quickly learned that sailors "worked like hosses at sea, but spent like asses ashore." Thus I made far more in generous silver tips than I ever earned by flogging newspapers. Hard by the waterfront, on the northern side of Erskine Street, stood an old ship's chandlery and sailor's outfitter, a bow-fronted emporium full of all the wonderful things that small boys' dreams are made of: brass bound ship's wheels, lethal-looking fids, sailmaker's palms, cakes of beeswax, tubs of aromatic Stockholm tar, oil lamps, hempen rope by the coil, bolts of flaxen canvas and the straw-filled ticking mattresses that sailors called "donkey's breakfasts." I still treasure a hand-embroidered sailor's keepsake from those days. "Don't wait for your ship to come in," it urged, "swim out to it." Had there been a square rigged ship at anchor in Blackwattle Bay in those days, I would have been sorely tempted to do just that, but Pamir, the last deep-waterman to sail from Sydney, had long since cleared the Heads for London. Unfortunately, I'd caught my sea fever too late. Over the years that missed opportunity became a source of profound regret, until that is, Seaforth, the British nautical publisher sent me a copy of Square Rigger Days, a beautifully illustrated book in which men who really did spend their lives before the mast, set down in vivid detail just how tough it really was. Their accounts quickly made me realise that I would not have lasted 10 minutes, let alone endured a voyage that might have gone on and on for years. Captain R. Barry O'Brien, who came up through the hawsehole to command several famous British ships, also served under blood and guts American skippers who were, he says, renowned the world over for the brutal treatment they meted out to their crews. "There were exceptions," Captain O'Brien writes, "but the majority of these Yankee packets richly deserved the title of 'hell ships' and 'blood boats'. "Their hard-case skippers and bucko mates, possessed by some diabolical and inhuman blood-lust, were experts in the art of 'working-up' and 'man-handling' refractory crews; and many cases are on record of their beating a man to death with belaying pins or knuckle dusters, or of subjecting him to such refined methods of cruelty that he went mad, or jumped overboard to escape from them. In rare instances these human gorillas were brought to justice and executed, or sent to penal servitude for long terms, but in the majority of cases they went free to perpetrate fresh outrages elsewhere upon long-suffering and downtrodden sailormen. "During my own sailing ship days (1880-1900) I was with a number of men who, at one time or another, had served in these American ships. Nearly all of them bore some mark - a scar, a permanent limp, or maybe merely a tendency to insomnia, to remind them of the fact. "One old shipmate I recollect in particular, who had served in a number of Yankee packets, had an ugly white scar running from his left temple, across the empty socket of his left eye, down to his mouth. A blow from a knuckle-duster had inflicted this hideous wound and the old fellow was as proud of it as a war veteran might be of his VC. "To have served in an American 'hell ship' and survived was regarded as a great honour. The experience lifted a man out of the ruck aboard a British 'lime-juicer', singled him out as a hard case, stamped him as a man of iron - to be looked up to, respected and admired by his shipmates. Indeed, I honestly believe that the old sailor I have mentioned would far sooner have had his ghastly scar, which never failed to send a shudder through me, than all the proverbial tea in China." Captain O'Brien recalls his time as an Able Seaman aboard the full-rigged ship Staroflndia under the command of the maniacal 'Captain X'. The vessel sailed from London, bound for San Francisco on December 5, 1887, and before she was clear of the Channel, O'Brien says, the new Captain made it known that he intended to run the ship in real Yankee fashion "and that when he spoke he expected everyone to flap their wings and fly". "As the Star of Russia ambled southwards through the tropics," O'Brien writes, "the Captain employed all the little tricks he had learned in Yankee ships to make life a hell for the men. The decks were holystoned and holystoned again, until they were as smooth as glass. The paintwork was washed and re-washed, until the sheen of the bare iron shone through it. "When the supply of holystones and washing soda began to run low, the cables were dragged up on deck and chipped; then the sailors were sent down to scale the damp, rust-stinking chain lockers with eight or nine men being herded into one locker, so that the air they breathed was foul and there was scarcely elbow room." This relentless hazing ultimately resulted in tragedy. "The Second Mate glanced at his superior in surprise for the cro'jack had been furled only a few hours before - there was far too much wind for it. He knew better than to argue, however. "The carpenter, sailmaker and bosun who were day men, turned out to bear a hand with the sail, and while its sheet was being hove down, a big sea broke aboard in the waist, sweeping the sailmaker overboard. The Second Mate threw a lifebuoy to him, but he might as well have saved himself the trouble, for within a few seconds the sailmaker had been swept out of sight in the smother of foam. "Later on in the morning, while a fierce squall was raging overhead, the cro'jack split from head to foot and blew into ribbons." There was no sailmaker to repair it. Having read all that, 1 thanked my lucky stars that 1 remained a landlocked lubber after all. This book is a wonderful record of these men and their ships and the sea. Thoroughly enjoyable, and once started cannot be put down. A book to grace any library and a must have publication for naval historians. The author has brought together the personal stories of the seaman who worked the square riggers in the closing days of commercial sail. A remarkable picture of what life afloat in those days was really like. Not the glory of the clipper ships but the hard working men of square sail. A fascinating book well put together and well illustrated. In Square Rigger Days there are accounts of angry shipboard exchanges, mutiny and murder. Seaforth Publishing is to be commended for salvaging Donville-Fifeâ€™s book which in the new edition includes many striking black and white photographs. If anyone reads it having harboured cosy perceptions of the last days of the great commercial sailing ships, the revelations in this book will hit them like a blast of Arctic seawater.